Today I took the HIV/AIDS club on a field trip to visit the New Start Voluntary Counseling and HIV Testing Center, located in Oshakati, a town about 120 km to the north of Ekulo. Of course, it began with a fiasco. I don't have to utilize any acting skills to convince the learners that I am totally incompetent when it comes to planning things in this country. The good thing is, the learners plan everything. 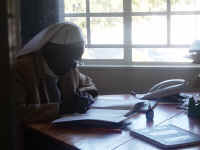 The bad news is, the learners plan everything-Ovambo-style. 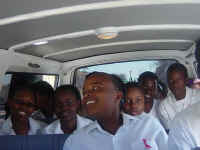 Therefore, due to a communication drought, Kristina and Teopolina arranged for Mathew, the husband of a teacher at our school, to take us to Oshakati in his mini-bus. Meanwhile, Fransina and Kornelia had arranged for Mr. Somebody, the husband of Meme Ileni, a hostel worker, to take us in his mini-bus. In the end, we chose Mathew, because his would hold 20 people and Mr. Somebody's would only hold 16. But some feelings were hurt. Saturday morning Mathew is supposed to pick us up at 8:00am. But he's late. Really late. I have many opportunities throughout the day to contemplate the truth of a quote from an Outside magazine article by Peter Maass about the war in Iraq, "The cliché about a battle plan not surviving its first contact with the enemy happens to be true. Improvisation is required in warfare, though improvising is a way of acknowledging that the chaos is stronger than your ability to master it." In fact, the whole of what I've learned in Namibia could be summed up as learning that the chaos is stronger than my, or anyone's, ability to master it. So I improvise, I go with the flow, I give up and wait. While waiting, some of the girls loiter around my house. I use the informal gathering to ask a few questions I've been wondering about. I ask, do girls at this school have sugar daddies? There's a bit of silent panic at the question. Finally Miina says, "Miss, we don't know. It's secret." So maybe they have them, but they don't tell anyone? "Yes. You only find out when they fall pregnant or commit suicide." Do girls at this school get pregnant? I'm wondering because the teenage pregnancy rate in Namibia is high: four out of ten girls will become pregnant in their teen years, but I've never noticed it at our school. "Yeah," she replies, "but it's rare." Has anyone gotten pregnant since I've been here? "No. But it's a big problem at the village schools." Why? "They don't know about it. Here, we know." Later, some of the girls are looking at my photos and asking about my family. "Miss, do you have brothers?" Yes, I have one brother and one sister. Kornelia says, "Oh, your family is small. Here, we can have even ten." How many children do you plan to have? She holds up two fingers. Why? I ask. "O! These people have too many children and then the parents just die. They leave many orphans. That's why we have extended families. You cannot just leave someone to suffer." Are many of the learners orphans here? "Everyone." Everyone? That's not possible. "More than half," she corrects. "Even me." At 10:20, Mathew and his mini-bus finally come. The excuse was that it had been stuck in the sand, which I find doubtful, since it's not even the rainy season and you just have to find a few people to push it out. At any rate, 19 learners plus myself pile in. Keep in mind that the "mini-bus" is really just a large van, extended to have four rows behind the driver, so the kids are pretty packed in. The driver, Mathew, cranks up the radio and we speed off to Oshakati at a rate of 140 kilometers per hour (87 mph). I'm sitting in the middle of the front seat, with the driver to my right, Kornelia to my left, and stuffed bee and giraffe toys dangling from the rearview mirror right in front of me. We pass a truck that is probably going 80km/h while the speed limit is 120. As we breeze past, Mathew nudges me with his elbow and says, "Women drivers. They don't know how to drive." I turn to Kornelia and say, our driver is misogynistic. "Yeah," she agrees. "Freddy is like that too. He is always dividing men and women." During the trip, Kornelia informs me that they make brown sugar from the palm trees and that if you eat too much, it will give you a cough. She asks me if we have cattle in the roads in America. I say no. We don't even have people beside the road like here. "What? How do they hitchhike?" They don't, in fact it is prohibited on the main roads. She laughs hysterically at my joke. She doesn't realize I'm serious. I finally convince her and she turns to tell Penda. A big argument ensues about whether Miss is lying or not. Finally Penda asks, "Ok miss, if they can't hitchhike, how do people get around?" They have their own cars or if you're too young, your parents drive you. "Oh! No miss." He shakes his head laughing at all the funny stories I'm telling this morning. "Miss is not serious." I am. Kornelia, referring to my question earlier that morning, tells me a woeful story of her friend. The girl dropped out of school around grade 8 and started going with the boys. "And miss, you know how I like church. So I go to her house with my Bible and start reading to her. But she just chases me away, saying, 'What do you know about life?'" Later, the girl has both a Sugar Daddy (around age 40) and a boyfriend, and she falls pregnant. She doesn't know which one is the father, so she tells the Sugar Daddy that the baby is his, because he is rich. The boyfriend assumes the child is his, but finds out about the Sugar Daddy when the girls tells him that it's not his child but someone else's. So the boyfriend drops her. Then, after some time, the Sugar Daddy gets really sick and dies. The girl is suspicious, so she and her baby go for an HIV test. The results come back HIV+ for both of them. "But miss, now she has another Sugar Daddy in Windhoek." Has she told him she is HIV+? "No, she is still fat. He won't know." But how can she do that??? "Miss, people are saying they don't want to die alone." The girl is only 18 years old. 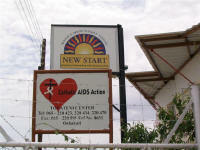 We arrive at the New Start Voluntary Counseling and HIV Testing Center around noon. We wander around the unmarked buildings a bit, trying to find where we are supposed to be. The only humans we find are two nuns sitting at the front of a room of school children. We interrupt their session, all the children stand up and Ooooh and Aaaaah over the white person with two Ekulo learners in tow, and we are told to go back to that empty looking building and go down the hall and around the corner to reception. Yes, of course, why didn't we think to look there? Back in the proper building, down the hall and around the corner, I introduce myself to Letta, the senior counselor. I'm happy that she got the message we were coming and is prepared. She leads us upstairs to a conference room. Here, she explains in Oshiwambo how the testing program works. Basically, you come and speak with a counselor about why you want to be tested. The counselor then explains about the test, and gives you the different options according what the results are. (There is a high rate of suicide among people who find out they are HIV+, so they have counseling to teach you how to live positively with the disease.) Then you get a card with a number (to assure anonymity) and a fake name. Next, you go and get tested. Then you come back in 3 days for the results, bringing your card. 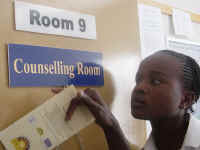 When you receive your results, you will receive more counseling, either on how to remain HIV negative or on how to cope with the disease. The cost is N$10, but is free to school kids. 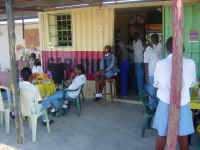 The learners then ask her a lot of questions such as, "Can you get HIV from saliva?" Only if you drink a liter of it. "Can someone test positive and then come back later and test negative?" Yes, it's possible, if they are using anti-retro-viral drugs that make their viral load so low that it is undetectable, but they still have the virus. After all the questions have been answered, she gives us a tour of the facility-where the testing occurs, who the counselors are, and concludes by taking us to the waiting room where we watch a video about the testing and counseling process. Some of the learners (brave souls!) have decided to be tested. This was what I was hoping for, but I didn't want to pressure any one. I also didn't want to stigmatize anyone by asking why they decided to get tested ("What risky behaviors have you been engaging in, young lady?"). I am worried about the results for Ruusa, who chose to be tested. In her essay last year on "My Most Memorable Day" she wrote about walking along the road one night and being raped by some anonymous men who were passing by in a car. As we wait for all the learners to get tested, I ask Kornelia if she'd like to be a counselor like the one who talked to us today. "Oh! Yes miss! I was just wishing it could be me!" I ask her if she would like to be a pastor, since she likes church so much and leads the school church service. "No. When you're a pastor you're just talking at people. I like conversations." While I'm at it, I ask if she wants to be President of Namibia. "Oh! Miss! President! No, I wish Sam Nujoma could be president forever. But you know, those boys, those Freddys and Mikes, they don't believe a woman can be president." It's just because men are usually president. But look at the world, look at history. We've always been ruled by men and what do we have? War and poverty. They've had their chance and they've failed. Let women rule for a while and you will get cooperation and plenty of food. Think of women-what do they do? They feed people. Put women in charge of the world and they will keep everyone fed. "Ja, Miss. Women, we must take control of the world." It's after 3pm by the time everyone gets tested, and the headless group moves, amoeba-like, down the street to the northern branch campus of the University of Namibia, where I want to show them the library and the small campus. We get there only to find that it is closed and gated. So I call Mathew to come and pick us up. He arrives promptly, and we go to Pick-N-Pay to buy some food, since we're all quite peckish. But alas, Pick-N-Pay is also closed. Next destination: Shoprite. Luckily, we find that Shoprite has decided to be open for business on a Saturday afternoon. As we all walk into the supermarket, some boys are hanging around the door and shout something to us in Oshiwambo. Kornelia is kind enough to translate, "Miss, they said we are all ugly." After I buy some bananas and a candy bar, I go back and sit in the van, eating and waiting for the learners to trickle back. Mathew starts saying something about the Mafia being here, but I don't really understand what he's talking about. A few minutes later, the Shoprite security guards are chasing down those same boys who said we were ugly. Mathew is smug. "I told you the mafias were here." You have the Mafia in Namibia? Nobody here is organized, least of all the criminals. Later Kornelia confirms, "Yes miss. Did you see those mafias being chased by the security?" Kornelia, what is a mafia? "It's just a criminal, someone who steals. When those boys called us ugly they probably wanted us to stop and shout back at them so they could grab our bags." So there you have it. We survived a mafia plot. We spend a long time in the Shoprite parking lot. Helvi comes back from the nearby KFC with an ice-cream cone, then everyone wants ice-cream. And fast food in Namibia is by no means fast. Meanwhile, the learners who did not get ice-cream are sitting in the van being hit on by some boys. Our bus is full of schoolgirls (of the 19 learners, 15 are female) and is a magnet for all those weird men who will ask where you live and pretend to be your new best friend within two minutes of meeting you. Katrina, unfortunately situated in a window seat, is doing her best to dissuade the gentlemen's advances. Finally, everyone has acquired their ice-cream, so we leave Shoprite and head towards Ondangwa, stopping at a few places to talk to various people that Mathew sees and knows along the way. 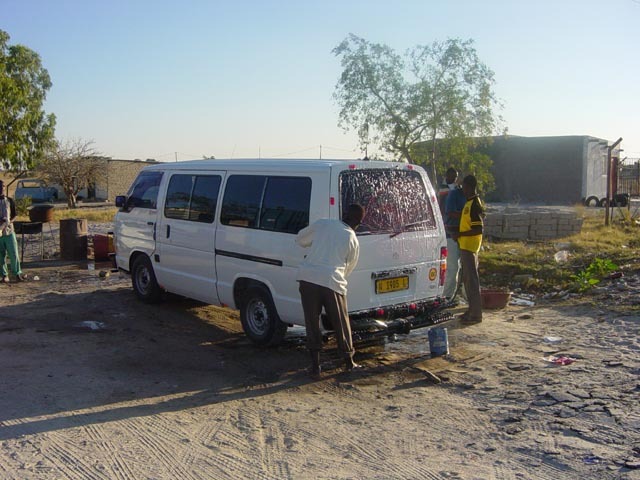 He pulls into the hitch point in Ondangwa to talk to some friends. I notice a large mini-bus entitled "Passenger Paradise" with the slogan "You'll Never Ride Alone." A nice euphemism for "You'll Be Squished In My Bus With At Least 30 Other Smelly People." Since we pause at this place, our van is again assuaged by young men interested in the Schoolgirl Mobile. One guy stands in front of the bus and blows me a kiss through the bee and giraffe, to the extreme amusement of the learners. An old man who is sitting in a chair next to a vacant bus starts whipping the men with a piece of cord he's found. "Down boy, down!" Next, we pass a cuca shop named, "The Bingo Bar and Bottle Store." The whole bus echoes with the kids shouting, "Bingo!" They had never heard of Bingo until I used it in class a few times as a review. For example, they make a bingo board on their paper but instead of numbers they put vocabulary words. Then I read off definitions, and they try to match the definition with the correct word. When they get five in a row, it's "Bingo!" and the rest of the learners groan because they were just one word away from having a Bingo! themselves. Maybe they imagine the Bingo Bar is dedicated to inebriated vocabulary acquisition. 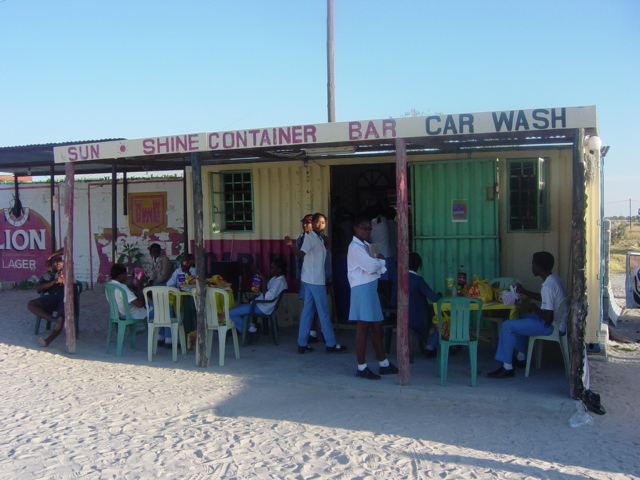 Our next stop is the Sun Shine Container Bar Car Wash. We all pile out and Mathew pays N$20 to have the van cleaned inside and out. (Doesn't he realize this will be futile since 19 sandy learners are going to get back into the van?) So there we are, at the bar. I hunker down at a plastic table and read my book, giving a clear indication, in case anyone should doubt, that I am a genuine nerd. I alternate between reading about low-wage workers in America and trying to keep an eye on all the blue and white uniforms that keep drifting off. Kornelia and Kristina go to the Normal Bakery (clearly, the title wants us to know, not one of those weird bakeries). Diogenus and Penda walk across the street to the gas station. Sam and Teopolina go down the road to the open market by the hitch point. 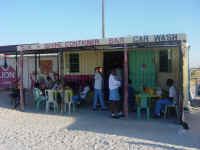 The rest of the girls drink coke and dance in front of the cuca shop. The music is so loud it vibrates my book. Once again, the girls have worked their magic and a crowd of men is assembling. When I get back to the states, and presumably become a teacher, I am definitely unfit to lead field trips. How could I create a permission slip for this sort of outing? After the van is shiny-wet clean, we're back on the main road and shoot straight for the large full moon rising. 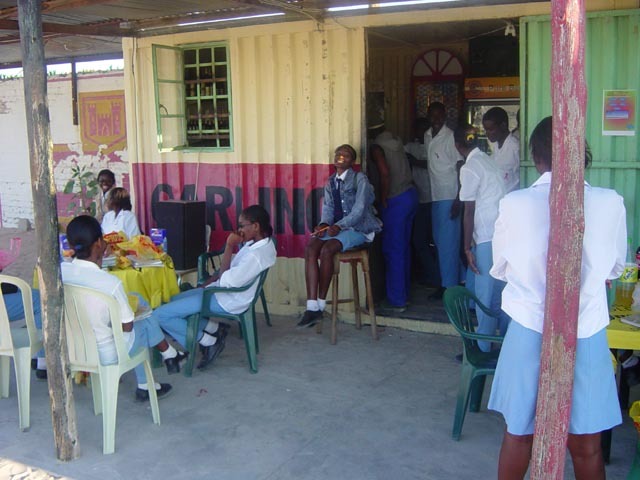 We arrive back at the school around 6pm, and Mathew, to the cheering of the learners, drives right into the center courtyard between the girls' and boys' hostel. I thank him for his chauffer service and hand over N$650. As the learners unfold themselves and pile out, like large clowns emerging from a small vehicle, I remind them to tell all their friends what they've learned about HIV testing today. "We will, miss. We will!" Kornelia goes even further, "Me? Even if I don't know someone, I will just tell them, 'You must go get tested.'" After all, as the New Start slogan says, "Life's about Knowing."